Between rounds of international intrigue and blood feuds (Scandalous Behavior, 2016, etc. 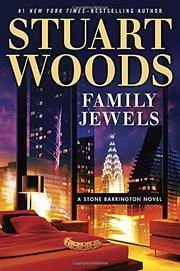 ), even superheroes need a little down time, and Woods provides some for New York cop–turned-attorney-turned–world’s policeman Stone Barrington in his latest outing. Shoe heiress Carrie Jarman Fiske comes to Stone because she’s convinced that her ex-husband, money manager Harvey Biggers, wants to kill her. And Harvey certainly acts the part to the hilt, turning up in public places to gawk at her, following her across the country to Santa Fe, trying to let himself in to her Palm Beach home. But the corpse Stone discovers in a bedroom next door to Carrie’s East Hampton place is that of a stranger, prostitute Darla Henry, who’d been Harvey’s companion at a New Year’s Eve shindig. What does her death mean? Nothing. Stone persuades Carrie to change the will that left her considerable estate to Harvey, but she gets strangled anyway deep in Georgia O’Keeffe country. Did Harvey, who’d been spotted nearby hours before, kill her? No. Even before the hostile ex, who’d claimed that Carrie was trying to kill him, proves a disconcertingly ironclad alibi, Stone has moved on to yet another complication: Carrie’s possession of a choker that looks just like the one Gustav Klimt’s model wore in the painting the movies have forever dubbed The Lady in Gold. Is it the real thing or a clever copy? And either way, will some forgettable jewel thief make off with it before Jamie Niven, Stone’s friend at Sotheby’s, places it on the auction block? If these questions make your heart beat faster, this is the tale for you. President Kate Lee also invites Stone to review the candidacies of three attorneys, one of them his insatiable ex-fling Tiffany Baldwin, for the Supreme Court. Maybe his recommendation will have consequences in some later installment of this bestselling series. A low-stakes, low-octane thriller that seems to have been cobbled together entirely from dead ends.